This week the eyes of the world were on the U.S. federal election. For those of us in Canada that means that we spent countless hours hitting refresh on news sites, facebook newsfeeds, and twitter. Some of you probably even kicked it old school and watched it unfold on television. When all was said and done Obama won and my personal twitter and facebook feeds were filled with comments of releif and jubilation (my friendship circle includes mostly academics and LGBT folks so this should come as no surprise). But there was one lone voice that spoke out with anger at the decision. "That's it! I'm moving to Canada! #ObamaCareSucks." Of course I had to give a little laugh at the absurdity. Universal publicly funded healthcare isn't new up here. In fact, it has been a source of great pride for our country collectively. The system isn't perfect but it has positioned us as a world leader in re-thinking healthcare philosophy. We imagine ourselves, however idealistically, as a nation who shares responsibility for one another's health and provides a safety net for those who need it. As the world was focussing on the activity south of our border, debating the merit of public versus for-profit health care, Canada was, quietly and carefully, taking the next step in improving a public health care system that seeks to put all Canadians on equal footing. On Monday November 5th, Canadian Blood Services in conjunction with the Ottawa General Hospital announced their plans to begin collection of umbilical cord blood for Canada's first public cord blood bank. The program is titled OneMatch Public Cord Blood Bank. Which you should probably try saying three times fast. Seriously, give it a try - I'll wait. OK, so creating succinct titles is clearly not their strong suit. But the program itself is pretty amazing. The OneMatch Public Cord Blood Bank will run as part of the OneMatch Stem Cell and Marrow Network (I won't even ask you to say that three times fast). Currently the OneMatch Stem Cell and Marrow Network works to recruit healthy and unrelated volunteer blood stem cell donors, conducts international searches for patients in need of stem cell transplants, and coordinates the delivery of blood stem cells in the event of a match being found. Unfortunately, approximately 50% of those patients searching for an unrelated donor are never matched. In part, this stems from Canada's extensive diversity since matches are most often found within the patient's own ethnic community. Prior to the launch of a public bank, Canadians have been able to bank their child's cord blood privately (with a hefty pricetag attached). This process is marketed as extra insurance for a child's health. However, the reality is that if a child is diagnosed with a disease that can be treated with stem cells, such as Leukemia, his cord blood likely won't be used because it would contain the same diseased cells. A Canadian public cord blood bank will help to solve these issues. In the spring of 2013 the Ottawa Hospital will begin to collect umbilical cord blood as part of the testing phase. Toronto, Vancouver, and Edmonton will follow suit in 2014. I attended the press conference put on by Canadian Blood Services and the Ottawa Hospital on Monday morning and I couldn't help but feel a certain amount of pride and excitement for a program that I, personally, had absolutely no hand in. This new bank will not only save many Canadian lives it will also contribute to the international evolution of stem-cell research. And it will do so in a uniquely Canadian way. 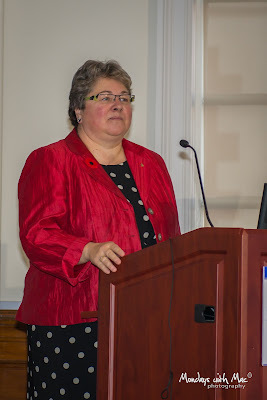 One of the speakers on Monday was Dr. Evelyn Voyageur, president of the Aboriginal Nurses Association of Canada. 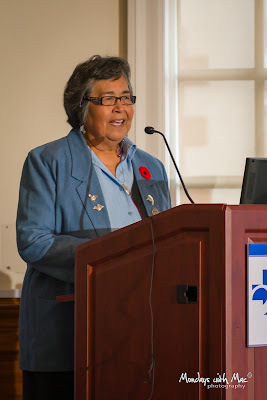 She spoke of the need to bring information on this program to First Nations peoples in a culturally sensitive way that recognizes the history of distrust and abuse from government and healthcare officials. Although new and innovative, the program will begin slowly. Careful research both into the science of donation and transplants as well as the physical and social needs of donors and recipients is well underway. For now we, as Canadians, can be proud of the work that has been done and can look forward to the day when the OneMatch Public Cord Blood Bank is up and running on a national level. Hopefully by then it has a snappy nickname that is much easier to say. Do you have any questions about how the OneMatch Public Cord Blood Bank? Ask in the comment section below and a representative from Canadian Blood Services will be by next week to answer them all!